With more than 4,000 colleges and universities in the United States and applications due in December or January, choosing the right school can seem difficult, daunting—darn near impossible. Have you considered every option? Are your child’s academic record and extracurricular accomplishments a good fit? With the following websites, the selection process can be, dare we say, fun? The site asks for the basic info—high school, test scores, grades, and activities—then takes it further by allowing kids to connect to their Facebook profiles. 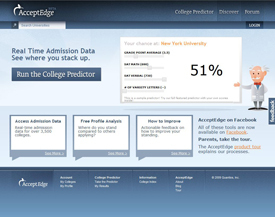 By doing this, AcceptEdge gets a deeper understanding of the child’s personality before suggesting possible matches. Results are based on data collected about students already attending. See how you stack up, what your chances are of getting in and even how small changes to your test scores or GPA can affect the results. 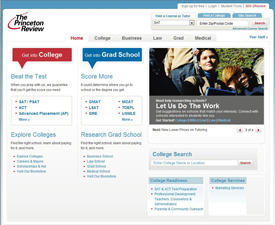 The Princeton Review’s Best Fit College Search takes students’ scores and GPA, family background, extracurricular activities, and a variety of other information to deliver a list of appropriate schools. 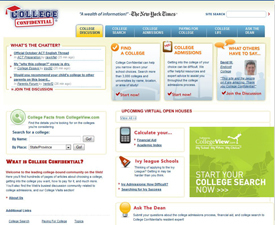 It also features the popular College Rankings section, in which students can discover the top 20 colleges in such categories as financial aid, best professors, and prettiest campus, as ranked by122,000 students at 371 colleges. At College Confidential, students can search for colleges by major or location, read articles about choosing and paying for college, or discuss the process on some of the Web’s busiest forums. Be sure to check out the "College Visits" section for reviews of recent on-site visits. And if you have questions, you can "Ask the Dean" for a personal response. I think it’s really important (and it’s something we do after not before) is to read reviews about the professors of a given college. I found the RateMyProfessor reviews very useful during my college years, but I wish I read some of them as i was choosing a school for myself. Sometimes you have to choose between a bad and a very bad professor for a particular class. Some schools are simply too cheap to hire really competent teacher - and you don’t want to end up in a high-level college with mediocre professors. You make the choice, the college is not the one who chooses you. Most Students are rejected because they think XYZ college is doing them a favor by accepting them. It’s your career, you pay the fees and you stay up late studying. If you think about it you are the one doing them a favor… you pay their salary. This economic climate is taking a toll on us, with lay offs and unemployement. Parents, Students we have to have a go Getter attitude, the future depend on us, Remember how much your worth and your education and career will be a breeze, no what the economic climate is.